The United States Congress designated the Red Rock Lakes Wilderness (map) in 1976 and it now has a total of 32,350 acres. All of this wilderness is located in Montana and is managed by the Fish and Wildlife Service. Red Rock Lakes National Wildlife Refuge, which contains Red Rock Lakes Wilderness, has often been called one of the most beautiful national wildlife refuges in the United States. The rugged Centennial Mountains, rising to more than 9,000 feet, hang above the Centennial Valley wetlands and provide a dramatic backdrop for this remote Wilderness. It was here, in the early 1930’s, among the inherent solitude and expansive wetlands that the last remaining trumpeter swans (thought to be extinct) were found nesting. Shortly thereafter, the Refuge and was established and today, a little over 60% of the Refuge is Wilderness. Red Rock Lakes Wilderness is a part of the largest wetland complex within the Greater Yellowstone Ecosystem and contains a myriad of other habitats. Although many visitors come solely to catch a glimpse of the elegant trumpeter swans or a moose, this Wilderness often surprises visitors with its remoteness and fantastic scenic and wildlife viewing opportunities. The diverse habitats in this area attract a variety of birds, including sandhill cranes, sage grouse, great blue herons, willets, avocets, long-billed curlews, grebes, short-eared horned owls, bald eagles, peregrine falcons, marsh wrens, mountain bluebirds, tree swallows, western meadowlarks, vesper sparrows and 18 species of duck, to name a few. Elk, deer and pronghorn return to the valley in the spring, just in time for the wildflower bloom and impressive mosquito hatch. Year-round residents include moose, wolf, red fox, badger, coyote, pika, raven and grizzly bear. Historically grazed by bison, prescribed grazing by cattle and prescribed burning help maintain a mix of shrubs and grass structure for nesting birds and forage quality for big game grazing. Red Rock Lakes is a highly productive, high elevation (6,600 feet) intermountain wetland habitat. In recognition of these lush, vegetated mountain meadows, the Refuge goal is to maintain dense vegetation which provides hiding cover for a balanced predator/prey coexistence. This results in viewing opportunities for fox, coyotes, wolves, badgers, and other predators, as well as prey species. The denser cover also maintains populations of rodents which provide prey for numerous hawks, eagles and owls. 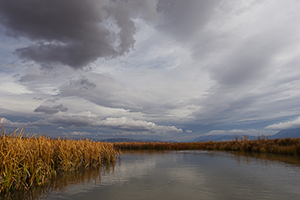 The riparian and riverine habitats on the Refuge are some of the most vegetated and diverse in the western states. Management focuses on maintaining willow densities for bird diversity and moose forage. Planning to Visit the Red Rock Lakes Wilderness? How to follow the seven standard Leave No Trace principles differs in different parts of the country (desert vs. Rocky Mountains). Click on any of the principles listed below to learn more about how they apply in the Red Rock Lakes Wilderness.